3046, USED RIM, 15X6-1/2, 5 LUG, 4-1/4", 93-94, MERCURY, COUGAR, SPARKLE SILVER LACE DESIGN. 472, HUBCAP USED, 14", 90-93, PLYMOUTH, ACCLAIM, VOYAGER, MACHINED METAL CAP, LACE DESIGN, WORD PLYMOUTH OFFSET FROM CENTER, GRAY POCKETS, METAL CLIPS. 734a, HUBCAP USED, 15", 77-89, MERC, FORD, PASS, COUGAR, LTD, LTD 11, CROWN VIC. LACE DESIGN EARLY BLUE LOGO IN CENTER, COMPARE RETAINING CLIPS, AVAILABLE IN SEVERAL COLORS. 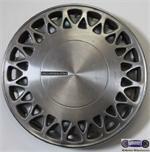 866, Hubcap used, 15", 88, LINCOLN, TOWN CAR, MACHINED, LACE DESIGN, ENGRAVED LOGO, SPRING CLIPS.